Micron Technology investors shouldn't miss these signs. Micron Technology (NASDAQ:MU) has made investors a lot of money on the back of the memory price boom. But there's always a fear that unfavorable market forces could knock the wind out of Micron's sails. This is probably why the memory specialist has been underperforming the broader market of late. Micron bulls believe that the slowdown is temporary and the company will bounce back soon, driven by strong demand for its memory chips. However, there is a strong possibility that the memory market will once again go into a state of oversupply and dent Micron's profitability. Here's what investors should be aware of. Micron gets 70% of its revenue by selling dynamic random access memory (DRAM) chips that are used in computers, mobile devices, and data centers, while 26% of its top line is supplied by NAND memory chips that go into solid-state drives. The prices of both these chips have soared tremendously over the past couple of years, boosting the company's bottom line from almost nothing to $14 billion. But Micron's latest results reveal that the rally could be nearing an end. The average selling price of DRAM was flat last quarter, while NAND prices dropped by percentages in the mid-teens. Still, both these segments enjoyed solid margin growth on a year-over-year basis. DRAM gross margin shot up 12 percentage points from the prior-year period, while the NAND business saw an 8-percentage-point increase. 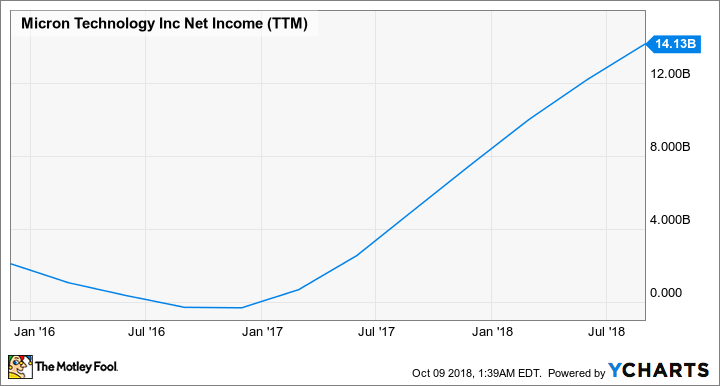 However, Micron will no longer spell out the gross margins of its individual business lines going forward. CFO David Zinser explained that the company wants to "keep confidential as much proprietary information as possible," so it has decided not to release this information. Since the chipmaker had no problems stating its strong DRAM and NAND margins when memory prices were rising, this change in policy makes me think things have turned for the worse and that is why Micron doesn't want to release the information. Additionally, Micron CEO Sanjay Mehrotra pointed out on the latest earnings call that a shortage of CPUs (central processing units) will hurt memory demand, as PC manufacturing will remain constrained. Micron customers are adjusting their inventory levels thanks to this development, leaving the chipmaker with more unsold inventory. 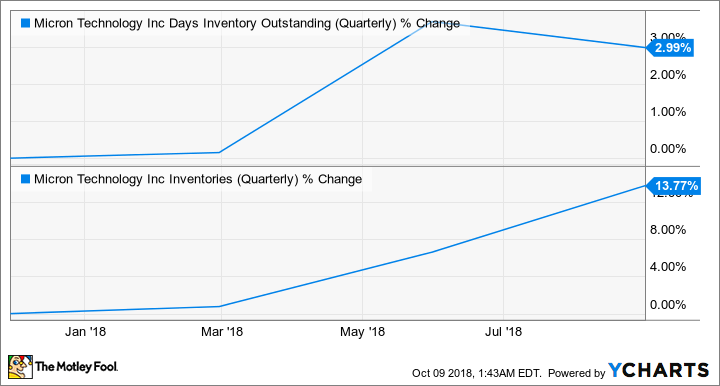 In fact, Micron's inventory levels have started rising over the past few months, and it is taking a bit longer to convert its inventory into sales. This is an early indication that the industry could be moving toward oversupply. The higher inventory levels explain why Micron's average selling price growth has hit a roadblock. But despite these red flags pointing to a slowdown in demand, Micron is moving ahead with an aggressive plan to expand its manufacturing capacity. This doesn't look like a good idea. Micron's capital spending in the recently concluded fiscal year stood at $8.2 billion, but it will increase to $10.5 billion this year. Approximately one-fourth of this will go toward capacity expansion and facility upgrades so that Micron can ramp up production of new memory technology when required. However, Micron isn't the only one looking to bring new capacity online. SK Hynix, for example, is making an $18 billion investment in a new flash memory plant to boost output by 40% in the next five years. This could contribute to an oversupply situation in the memory market. An anticipation of slowing demand is probably why Samsung, another major memory player, has decided to scale back chip production. Projections from market research firm Gartner indicate that the DRAM industry could peak in 2019, hitting revenue of nearly $120 billion before dropping to less than $80 billion the following year. If that's indeed the case, Micron could see a major drop in both DRAM and NAND prices that will dent its profitability. As it is, DRAM prices are expected to grow 38% this year after an impressive jump of 81% in 2017, according to IC Insights. The firm goes on to forecast that average DRAM prices could drop 6% in 2019 and 14% in 2020. Micron reported solid results in the latest fiscal year, but the rate of growth in memory prices is slowing down. Its inventory levels are rising and there is a chance that the memory industry will go into oversupply. Micron has struggled badly when memory prices have gone bust in the past. 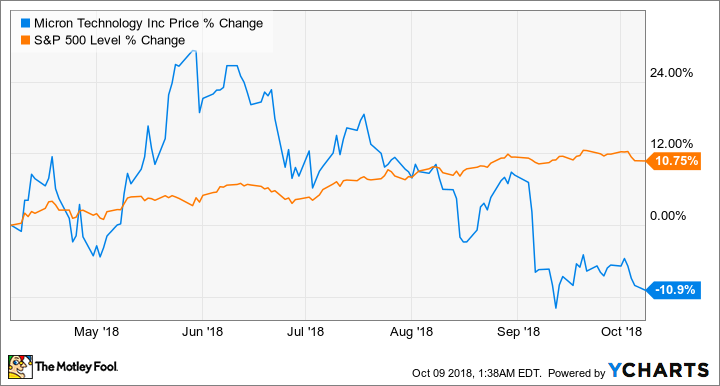 So if history repeats itself next year, the chipmaker will find itself in a tough spot, and its stock price could keep underperforming the broader market.